What are the signs and symptoms of heart murmurs in infants, children, and adults? What causes heart murmurs in infants, children, and adults? What are the risk factors for heart murmur in infants, children, and adults? What exams, tests, and imaging studies diagnose heart murmurs in infants, children, and adults? What is the treatment for heart murmurs in infants, children, and adults? What are the complications of a heart murmur in infants, children, and adults? What is the prognosis and life expectancy for infants, children, and adults with a heart murmur? When should in infants, child, and adults seek medical care for a heart murmur? Can heart murmurs be prevented in infants, children, and adults? Heart murmurs are abnormal sounds within the heart due to turbulent blood flow. A bluish tinge on the skin, lips, or fingernails. Paliptations or a rapid hear rate. Edema (swelling) of the legs or feet. Most types of heart murmurs are functional, or physiological, and are normal variants. They are often known as "innocent murmurs." Some heart murmurs are caused because of an abnormal function of the heart valves. The heart valves may have narrowing (stenosis) or they may leak (regurgitation). Holes in the septum or wall that divides the atrium or ventricles (septal defects) may cause a murmur. A heart murmur is a physical finding and not a structural problem within the heart itself. Treatment is aimed at the underlying condition. A heart murmur is a continuous sound that is audible with a common stethoscope, produced when blood passes through particular areas of the heart. The heart has four chambers, two atria (singular = atrium) and two ventricles separated by a "skeleton" of cartilage that separates each chamber. This skeleton is made up of the atrial septum, the ventricular septum, and four valves (aortic, pulmonary, mitral, and tricuspid) that direct blood flow in a specific route within the heart allowing the most efficient use of each heartbeat to pump blood to the rest of the body. Each heartbeat has two phases, systole when the heart pumps and diastole when the heart chambers fill with blood. Blood enters the right atrium from the body via the vena cava. It travels through the tricuspid valve into the right ventricle. A systolic heartbeat sends the blood through the pulmonary valve, which separates the right ventricle and the pulmonary artery, to the lung. In the lung, oxygen is delivered to red blood cells and carbon dioxide, a waste product of metabolism, is removed. The oxygenated blood returns to the left atrium where it travels through the mitral valve into the left ventricle. The systolic heartbeat also causes the left side of the heart to contract and send the blood through the aortic valve that separates the left ventricle and the aorta. Blood passes through the aorta to the body delivering oxygen to the body's tissues. The sound of a murmur is generated when blood flow within the heart is not smooth and turbulence occurs. Using a stethoscope, a health care practitioner may be able to hear a heart murmur during the physical examination. Not all heart murmurs are abnormal or dangerous and may be innocent, but if one is present it may potentially signal a structural abnormality of the heart. Picture of the heart and heart valves. A heart murmur itself does not causes symptoms. Generally, it doesn't cause symptoms, and can't be heard by the person with the murmur. The underlying structural issue of the heart may cause problems; however, any heart murmurs are innocent and of no consequence. Difficulty developing, and gaining weight appropriately. Most heart murmurs in well-developed children are harmless. In adults, heart abnormalities may cause chest pain, and heart failure with symptoms of shortness of breath and swelling of the extremities. Palpitations or a sensation of an irregular heartbeat are occasionally seen in people with with heart valve abnormalities. Many heart murmurs are harmless and referred to as innocent or functional. They are caused when blood rushes through the heart quickly during normal function while no heart disease may exist. There may be an underlying medical condition that can lead to an innocent murmur. These may include situations where the heart beats more quickly such as fever, anemia, hyperthyroidism, and pregnancy. Congenital heart murmurs are heard in the newborn. 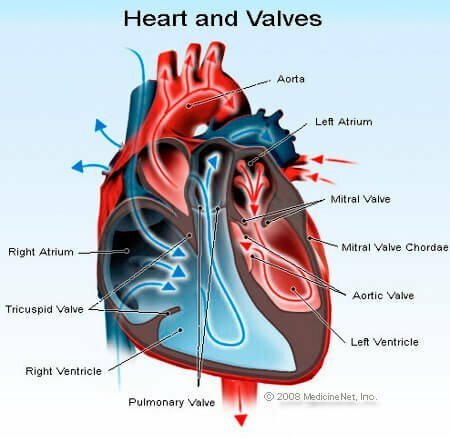 They may be due to abnormalities in the valves, septae, or arteries, and veins that carry blood to and from the heart. In some complicated heart disease conditions there may be a combination of all three. Many congenital heart murmurs resolve spontaneously without medical intervention while others require surgical operations for repair. Patent ductus arteriosus (PDA) may cause a heart murmur in a newborn. Prior to birth, the aorta and pulmonary artery are connected by a small artery, the ductus arteriosus, to complete fetal blood circulation since oxygen is supplied to the fetus by the placenta. Shortly after birth, this artery is supposed to close. If other congenital heart abnormalities exist, the ductus may remain open to help maintain some blood circulation. Sometimes, when no congenital abnormalities exist, the ductus doesn't completely close and a murmur may exist. Many times the patent ductus arteriosus closes by itself over time. Occasionally, medications or surgery may be required to close off a patent ductus arteriosus. Abnormalities of the valves of the heart may cause a heart murmur. Any of the heart valves may be affected and clinical symptoms depend upon the severity of the valve damage and whether the blood flow pattern within the heart is maintained. Each valve problem often leads to a specific character and timing of heart murmur. Valve stenosis is narrowing of a heart valve. This often occurs over time as the valve scars due to injury and scarring from infection such as in rheumatic fever or from a congenital birth defect. Calcification of a valve may also result in stenosis. This causes the heart muscle to work harder to push blood through the narrowed opening. Like any muscle that has to work harder, heart muscle will hypertrophy and thicken. Heart failure, where fluid builds up in the lungs and extremeties, may be a complication. Valve regurgitation (or insufficiency) is a valve that leaks causing blood to pass backward against the normal blood flow pattern in the heart. A valve may have both stenosis and regurgitation. Valve sclerosis is the mild narrowing and stiffening of the valve (most often seen in the aortic valve) due to aging. It is associated with atherosclerotic heart disease. Valve prolapse is a bowing of a valve that causes some leaking and most often involves the mitral valve. Endocarditis is an infection of the lining of the heart that may involve and destroy a heart valve. The source of the infection is usually elsewhere in the body and it travels via the bloodstream to infect the heart. There may be a previous underlying heart condition. Holes in the walls of the heart (the septum that divides the heart chambers) can be the source of a heart murmur. Atrial septal defect (ASD) describes a hole in the wall that separates the collecting chamber of the heart while a ventricular septal defect (VSD) affects the wall dividing the pumping chamber. A heart murmur is a physical finding of an underlying heart condition and in many instances may be of no consequence. The risk factor for developing a particular murmur is the risk factor for the underlying condition. Congenital heart disease tends to have a familial basis, meaning that there may be a genetic predisposition for a baby to develop a structurally abnormal heart. Some valvular diseases are present at birth, but take a lifetime to develop symptoms. For example, the aortic valve is supposed to have three leaflets that come together; some people are born with a valve that has only two leaflets (bicuspid). Over time, a two-leafed valve may be more prone to calcification and narrowing. Symptoms may only be seen later in life. Some valve diseases are due to infection (endocarditis). Historically, rheumatic fever described heart valve inflammation as a consequence of a bacterial streptococcus infection. With present day screening for strep infections and the appropriate use of antibiotics, this rheumatic heart disease is rare. Endocarditis may be seen as a complication of intravenous drug abuse. Other risk factors for heart valve abnormalities include atherosclerotic heart disease, heart attack, aortic aneurysm, and connective tissue disorders such as systemic lupus erythematosus and Marfan syndrome. Each condition affects the valves in a different way causing them to malfunction and develop the physical finding of a heart murmur. A heart murmur is usually diagnosed during a physical examination by the health care practitioner while he or she listens to heart sounds with a stethoscope. Evaluation of the heart begins with questions relating to heart function. In an adult, some questions may include asking about chest pain or pressure, shortness of breath with exertion or at rest, and swelling of the legs. In an infant, the symptoms may include poor sucking or eating, poor weight gain and growth, or episodes of cyanosis (turning blue). Physical examination includes assessing skin color, feeling and assessing pulses, evaluating the legs looking for swelling and edema, and listening to the lungs for signs of fluid buildup. Heart evaluation includes assessing the rate and rhythm of the heart. Is it too fast, too slow, regular, or irregular? The front of the chest can be palpated; a hand is placed on the area overlying the heart trying to feel for a vibration (thrill) that can occur with an especially significant heart murmur. Many murmurs are diagnosed as normal (physiologic) based upon physical examination and require no further evaluation. Initial testing may include an electrocardiogram (EKG) which can help evaluate the heart rate and rhythm, electrical conduction within the heart, and whether hypertrophy or excess heart muscle has developed. A chest X-ray may help evaluate heart size and shape and may find excess fluid in the lungs due to abnormal heart function. If further testing is required, often an echocardiogram (ultrasound) examination of the heart is helpful in visualizing the structures and functions of the heart. The echocardiogram can help to determine the specific diagnosis when a heart murmur is present. A cardiac catheterization is an invasive test whereby dye is injected directly into the blood passing through the heart structures to help evaluate their status. The treatment for heart murmur depends upon the particular cause and the underlying medical status of the patient. Many murmurs need no further evaluation, can be monitored, or are a normal variant. Some murmurs are associated with serious infected valves and require antibiotics. Some valves are structurally damaged and require surgical repair. Atrial septal and ventricular septal defects may require surgery for repair, depending upon the situation. Newborns, infants, and children who have congenital heart disease may need the help of a cardiologist to determine the need for medications, surgery, or observation. A heart murmur is the physical finding of an underlying structural issue within the heart. A heart murmur itself has no complications. The ramifications of a heart murmur are based on the particular underlying abnormality causing the murmur, and the effect it has on cardiac physiology. Many people have physiologic heart murmurs and need no intervention or care. Those whose heart murmurs signal that there is a structural issue with the heart may be monitored for symptoms that gradually develop over time. In infants and children, heart murmurs due to atrial or ventricular septal defects may need surgery to repair the abnormality and they can expect to have a normal heart after repair. In adults, medications and lifestyle changes may help minimize the need for surgery to repair or replace a damaged heart valve. The goal is to return the blood flow patterns in the heart to normal, and allow the person to return to an active and normal lifestyle. Generally, a heart murmur does not cause symptoms. It is the underlying heart function issues that often cause people to seek medical help. Chest pain and shortness of breath should always be taken seriously and not ignored. Medical help should be accessed immediately if a person has heart or lung concerns. It is important to remember that a heart murmur is a physical finding and is not a disease or structural heart problem. Rather it is the sound that is made because of a potential blood flow problem within the heart. Maintaining a life-long heart-healthy lifestyle may help prevent some heart valve issues. These lifestyle opportunities include keeping blood pressure, cholesterol, and diabetes under control. It is a positive choice not to smoke. Regular exercise and weight management also contribute to a healthy heart. Historically, rheumatic fever was a complication of strep throat (streptococcal pharyngitis). This could cause heart valve damage and the development of a heart murmur. With the advent of good screening tests for strep infections and the appropriate use of antibiotics, rheumatic fever is a rarely diagnosed condition. Heart Murmur. healthdirect. Updated: Feb 2018. Mann, D. L., et al. Braunwald’s Heart Disease: A Textbook of Cardiovascular Medicine. 10th edition. Saunders. 2014.